The first thing we decided to do, as a group, was a bicycle tour of the East Lothian coast & castles. We hired guide Alistair, with 2wheel-tours, to facilitate our exploration of the region. While we were waiting for our friends to join us, we decided to spend the morning hiking in Holyrood Park. In Scotland Eyewitness Travel, it says, “The area has been a royal hunting ground since at least the time of King David 1 (1153AD) and a royal park since 16th century.”. 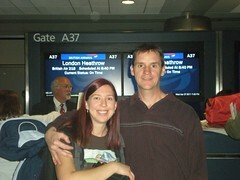 After a long flight, we made it to London Heathrow Airport. We each managed a couple hours of shut eye during the flight, and we arrived feeling not that bad considering. 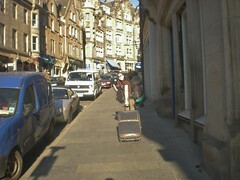 A second, much shorter flight, deposited us in Edinburgh, Scotland. When we got off the bus, we were completely turned around. We almost got lost due to jet lag and a general sense of exaustion. It wasn’t exactly obvious which way was North/South. Finally, some construction worker pointed us in the right direction. Here I am hauling our checked bag up a steep road, what a behemoth! On Wednesday morning, we finalized our packing and ran last minute errands. Jenny came over to take us to the airport, she had also agreed to take care of the cats (Thanks, Jenny!). As a risk mitigation strategy, I took the following picture of our checked bag. 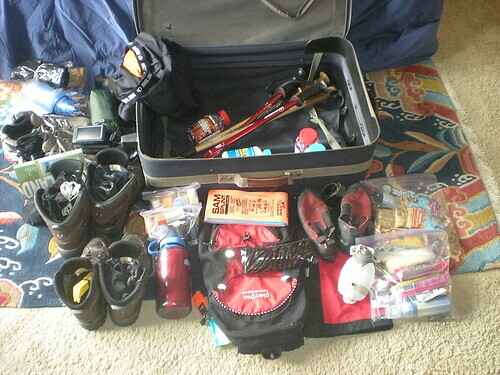 Normally, we don’t check a bag-but this is Scotland and there are just too many potential activities to fit all the gear in the overhead compartment! On Sunday, I had a fabulous time summitting Silver Plume Mountain (12,457 ft) along with 7 other members of the CMC. This was my 2nd Co-Lead (aka Leader In Training) hike, and I was fortunate to have Dave as my sponsoring Leader. 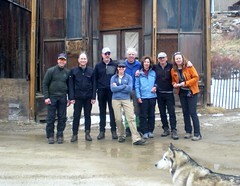 Dave was thought provoking and challenged me to continually assess the conditions, decisions, and mood of the group. I decided to be a consensus building leader, so my approach was to include the group as much as possible. Dave helped to cement, in my mind, where & when the consensus approach might need to be adjusted-such as situations with a “Big Ego Climber” or “Indecisive Sheeples”. You are currently browsing the climbergirl blog blog archives for April, 2011.